An outdoor deck acts as an extension of your home. It serves as a transition point between the home and the yard, providing a flat surface, with easy access to the home, an area where chairs and tables can be placed, as well as an outdoor grill. A deck is also able to create space where it otherwise would not exist. If your home is situated on a steep hill, or very uneven terrain, a deck can create space where it otherwise would not have existed. They are also wonderful around pools, Jacuzzis and other similar features. On upper levels, they become wonderful lookout points. Be sure to use a quality wood and protect it against the elements with proper stains and finishes. A fence is a great way to add privacy to your home as well as security. It creates a border and also lets you maintain your own environment. If you have a Japanese style garden and your neighbor’s yard looks like a wild forest, the two would not blend very well, With the use of a wooden fence, you can add plants near the fence line, and maintain control over the look and appearance that you want to create. A chain link fence is basically to keep people, pets, or other animals in or out of your yard, but not a visual barrier, or border. 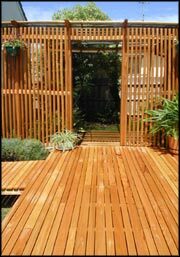 A wooden fence will create the physical and visual barrier and border.